Senior Fellow at the Berkley Center for Religion, Peace, and World Affairs, Executive Director of the World Faiths Development Dialogue. Her current work focuses on teaching and research on a wide range of topics at the intersection of development and religion. 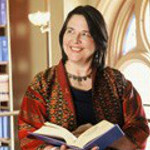 Katherine Marshall leads the Berkley Center’s work on faith-inspired institutions working in development, which involves a series of regional background papers and consultations with academics and practitioners, and a series of reviews of specific development topics (HIV/AIDS, gender, and shelter).